the last article was from February this year (he must have been busy since than...lol), which I think would interest the readers here too- the video interview is perfect to get to know Matt a bit. A couple weeks ago I had the pleasure of sitting down for an interview with Rhonda Schaffler at Reuters Insider in New York. 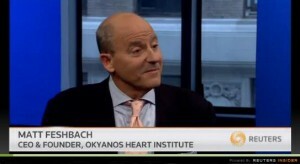 We covered a little bit of everything, including my hedge fund days and the transition from short selling to what I have been most focused on as of late, Okyanos Heart Institute. In the interview itself we talked a little about Okyanos and our mission, which is to provide a new standard of care for heart disease patients through cardiac cell therapy. Okyanos treatment involves isolating adult stem cells from the patient’s own body fat, which are then reintroduced into the heart muscle. In other words, capitalizing on the body’s own natural biology and enabling the heart to, in a way, heal itself. I am very grateful for the opportunity to speak about our purpose at Okyanos. We have assembled a great team and a very supportive, like-minded group of investors, and I look forward to being able to treat patients at our center in The Bahamas in the coming months. Many thanks to Rhonda and the Reuters team for having me on – it was a pleasure. Thanks Fas, very interesting video. Matt could have financed the entire Okeyanos project by shorting Cytori. With the relationship he has with Cytori , I wonder why management never went to him for advise on financing or how to combat the attack by shorts on Cytori. This video is a breath of fresh air after several weeks of torture. lalrhough April, 2014 date, had not seen it. Thanks!